For Christmas Santa gave my daughter and me something I have wanted for us for a long time. 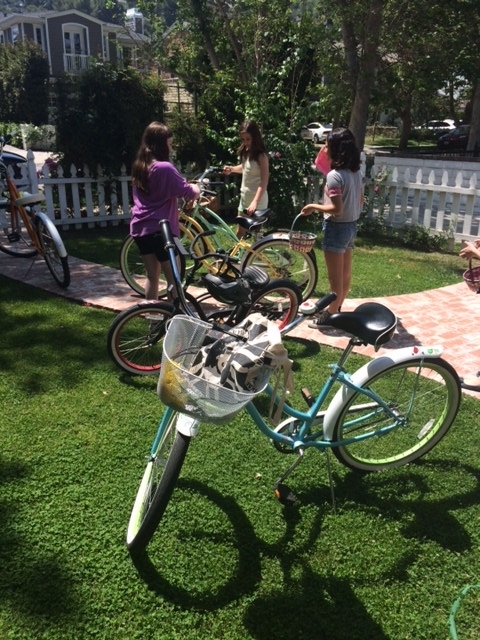 Beautiful beach cruisers with cup holders, baskets and bells that help mama bird communicate to baby bird as we ride. I haven’t had a bike since I was eleven years old and my daughter hasn’t had one since she was four. We were due. And, just as the saying goes… you never forget. Every weekend our bonding time has been spent riding all over Studio City (you might spot us if you’re ever in the neighborhood). We ride everywhere, taking pictures, stopping at Starbucks for hot chocolate and, best of all, talking. Conversations that might otherwise not happen if we were at home watching television or on the computer or running errands in the car. Something about the quiet weekend side streets, the wind blowing in our hair and the smell of fireplaces, cooking, and flowers whipping by as we pedal around our little world is nothing short of grace. And here is where the talks begin. The questions about life, the stopping in front of our dream house and wishing one day for our own, the wondering what middle school will be like, and the sharing of fears. Mama in the lead, baby behind, and the ringing of a bike bell every so often when crossing a street to make sure the bell behind rings back. When I was a kid I rode horses. The drive to the stable was long but some of my best memories I have of being with my mom took place on those drives. We’d get up early before anyone else was awake. I’d get on my jodhpurs and boots and we’d climb in our Jeep and head for the hills. And on that drive it was our time. Quiet, no cars on the streets, and the anticipation of getting on a horse and wondering if I could make the next jump was always in the air. But, best of all… we talked. We talked about school, work, family, friends, dreams and fears. When I was thirteen and took a bad fall I never got on a horse again. I gave up the jodhpurs and the boots… and the drive with my mom. I think more than missing riding… I miss those talks. I don’t know if Santa knew what a gift he was really giving us when those bikes appeared in front of our tree. Life is about moments. I’m about to go for a ride with my girl and make some.